Description - What is the number one thing on anyone's mind when they are watching their loved one playing a sport? Safety. Safety is the number one reason why many sports facilities have gotten rid of their natural grass and turned to field turf. With our Sports Play Turf Rolls in your facility, you can rest assured that your loved one will be very safe. Now, having turf doesn't mean you will eliminate injury, but it will help to curb it. Now the turf alone will not provide you with all the benefits needed to play any sport properly. Our field turf is a system that also involves adding the proper amount of infill to your field. Infill is the glue that makes everything work properly. With 3-4 pounds of infill per square foot, you will provide the proper cushion and bounce to your new field providing any athlete with all that they will need to excel properly. A 10-year warranty backs our Sports Play artificial grass. Face Weight – 40 oz. Weight – .44 Lbs. per square feet. Recommended Uses – Sports Play Turf Rolls are the perfect alternative to natural grass for any field. This field turf has been used as artificial grass for football fields, soccer fields, for field hockey, for rugby, and much more. Do you have any padding available for the artificial turf? 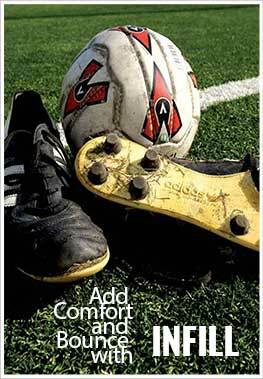 We have several padding options available for our artificial turf. Please see our Lawn Pad, Multi Use Pad, or Flo Through products.